According to an official release, the Yesvantpur - Bhubaneswar Super Fast Tatkal Express (Train No. 02253) will leave Yesvantpur at 1.30 pm on Saturday and reach Bhubaneshwar at 4 pm on Sunday. File image of passengers boarding a train. 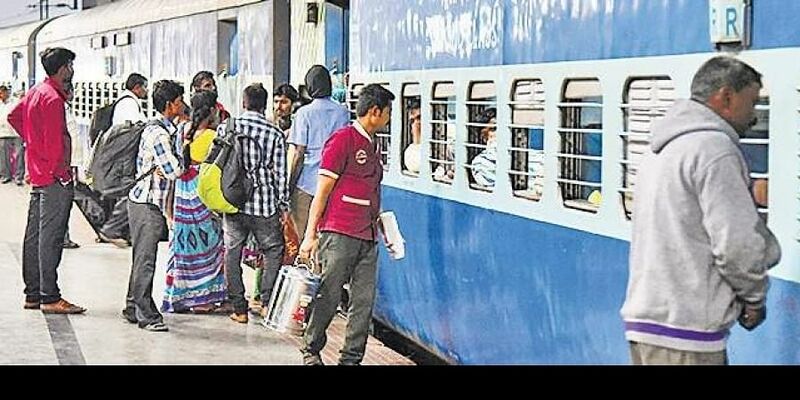 BENGALURU: To clear the extra rush of passengers owing to cancellation of trains along this route, a superfast Tatkal Express will run between Yesvantpur and Bhuba neswar on Saturday (October 13). A train in the return direction will run up to Bengaluru Cantonment on Monday (October 15). According to an official release, the Yesvantpur - Bhubaneswar Super Fast Tatkal Express (Train No. 02253) will leave Yesvantpur at 1.30 pm on Saturday and reach Bhubaneshwar at 4 pm on Sunday. It will have stoppages at Krishnarajapuram, Jolarpettai, Katpadi, Renigunta, Gudur, Nellore, Ongole, Vijayawada, Rajahmundry, Duvvada, Visakhapatnam, Vizianagaram, Berhampur, and Khurda Road before terminating at Bhubaneswar. The Bhubaneswar - Bengaluru Cantonment Super Fast Tatkal Express (Train No. 02510) will leave Bhubaneswar on October 15 (Monday) at 7.50 am and reach Bengaluru Cantonment at 11.40 am on Tuesday. It will stop at Khurda Road, Balugan, Brahmapur, Palasa, Srikakulam Road, Vizianagaram, Visakhapatnam, Rajahmundry, Vijayawada, Perambur, Arakonam, Katpadi, Jolarpettai, Bangarpet Krishnarajapuram, and Bangalore East.